Conventional ring spinning is still the most widespread spinning process on the market, although compact spinning is steadily gaining ground. There is a growing demand for the processing of blends. Special yarns round off the market requirements. Rieter has high-level coverage of these requirements and thus wins a greater market share. In the important markets, compact spinning is equated with the name Rieter. 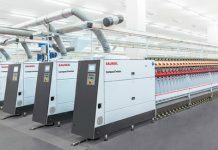 The unique process offers enormous productivity increases and superior yarn quality. Clear advantages for customers are achieved by the conventional Rieter ring spinning machines. 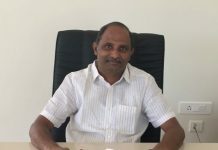 Especially in the blend and special yarn sector, they are being further developed. The production capacities of cotton are today insufficient to cover the global demand for fibres. According to an external study, today already near to 60% of spun staple fibre yarns contain man-made fibres, in their pure form or in blends with other man-made or natural fibres. Many of these yarns are successfully produced on universal Rieter machines. A special machine is unnecessary but special components can support the spinning capability. Rieter already took this trend into account some time ago: strengthened elements and a greater bottom roller diameter are just two examples. Now, the unique solution for controlled underwinding free doffing SERVOgrip offers a new feature in the form of a cutting device. It ensures with very firm yarns and also with core yarns the perfect cutting of the yarn at doffing. Special yarns such as core or fancy yarns are today no longer a niche, but an integral market component. Where previously effects were mainly a trend for denim, these yarns now fulfil a great demand in practically all outerwear applications. These fancy yarns are often combined with core yarns. The latter are also indispensable in underwear. Depending on the quality of the finished product, and the cost efficiency and handling of the equipment, Rieter currently offers the right solution for all possible applications. Rieter plays the role of a trusted partner and system supplier be it our own development or in combination with specialists. The ring spinning machine is the machine in the spinning process with the highest energy consumption. 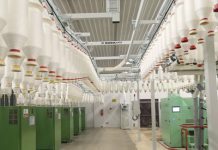 The costs for energy consumption correspond to approximately 50% of the yarn manufacturing costs. The faster the machine runs, the greater its share of the total manufacturing costs for power. This makes it even more important to exploit every possibility to save energy and thus costs. In the last 20 years, Rieter was always able to set the benchmark in energy consumption. Today, around 25 to 30% less energy per kilogram of yarn is used than at the beginning of the analyses. The advantage over its competitors always lies in the two-digit range – not only in conventional spinning but especially in compact spinning. This could recently be reconfirmed in a comparative measurement. Important is that not only the basic machine, with the well-conceived spindle drive, but also the suction device provides significant benefits. In addition, Rieter compacting has the lowest energy consumption of all compacting systems. Alongside the power consumption, highest possible productivity is crucial for favourable production costs. The spinning speed is especially reliant on the raw material and on the spinning preparation process as well as on the spinning machine. Based on the unique Rieter spinning geometry, in ring as well as in compact spinning, considerably higher spinning speeds than found with competitor products are possible. Today, Rieter machines often achieve spinning speeds of up to 25000 rpm. Rieter ring and compact spinning machines fully cover the current and future market requirements and provide low yarn manufacturing costs and excellent yarn quality. The higher market share which has doubled in ring spinning over the last 4 years and the high level of customer satisfaction clearly reflects this.